How served: 22oz capped bomber poured into a Stone Levitation glass. I paired this beer with: A full rack of Baby Back Ribs with a spicy barbeque sauce. It was great pairing this DIPA with these ribs and its spicy/tangy barbeque sauce. Too bad I didn’t enough for a second helping. Tasted on: Thursday January 21, 2010. Note: Of the 2 Big San Diego Double IPA’s I’ve had this week, I liked the Dorado a hair more. With that said this as still an amazing brew with a great aroma and a very balanced hoppy taste. On the Label: Karl’s Coastal Reserve: To kick off this series of intense hoppy beers, we wanted to go big. Imported New Zealand Nelson Sauvin hops provide a vibranttropical aroma that raises eyebrows and expectations. Aggressive amounts of Warrior and Ahtanum hops produce an assertive bitterness that stands out against a firm malt backbone. Balanced even at 90 IBU’s, Big Barrel leaves a considerable first impression that serves as a prelude of things to come. 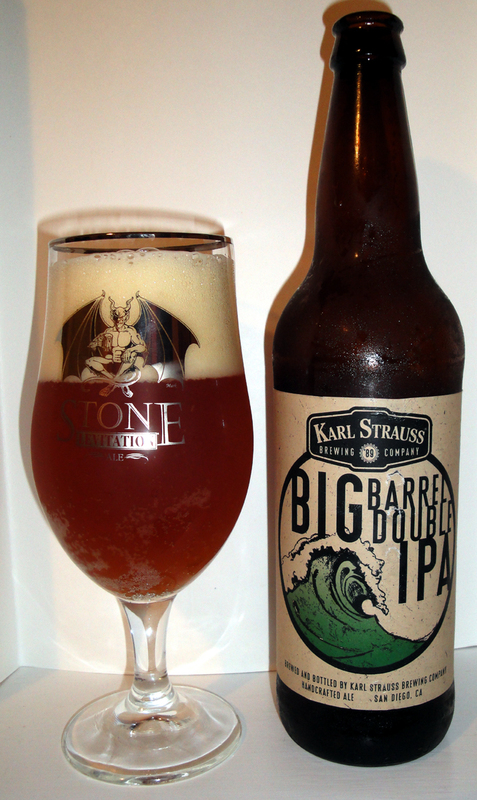 Big Barrel Double IPA is an intense West Coast IIPA for hop lovers. Abundant imported New Zealand hops give this medium-bodied ale fruity citrus and white grape-like flavors over a firm maltiness. It finishes dry with a lingering bitterness.